Last year on 19th January I posted a picture of our bucket fed baby calves. A year down the road and look how well they have done. They are still as friendly as ever and demand to be tickled, scratched or fed – preferably all three! 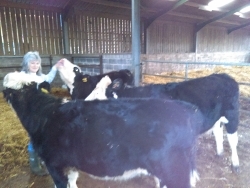 This summer will see them go to bull and we wait until 2018 for them to calve and yet another year until 2019 when we will eventually be able to sell their calves and finally reap some financial benefit from caring for them and feeding them since November 2015. Cattle farming on the hills is a very long term venture. Copyright © 2012–2019 Miles & Gail Fursdon. All rights reserved.